It is put directly of the ice of the Ob Bay near the spot for Novatek’s new LNG terminal. Few days earlier, the ship had set a record as the biggest ship ever to sail up the Northern Dvina towards Arkhangelsk. «The passage from Arkhangelsk proceeded according to plan and took a total of five days,» says shipping director at Atomflot Andrey Smirnov. «The «Sevmorput» independently sailed through the Kara Gate and demonstrated excellent sailing qualities,» he underlines. 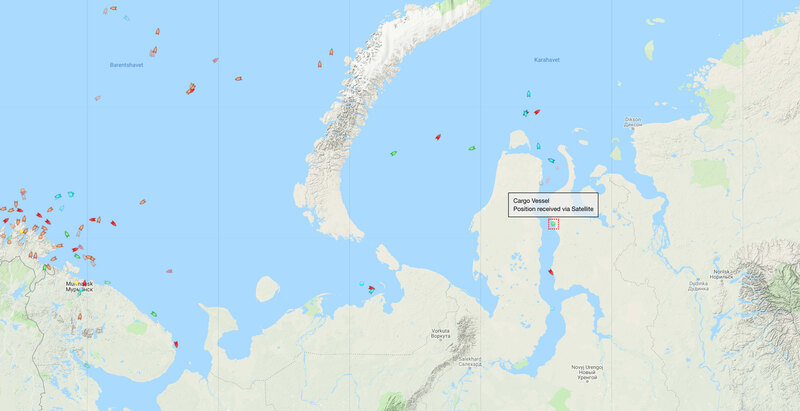 When entering the Kara Sea, the container ship was escorted by nuclear-powered icebreakers, first the «50-Let Pobedy» and then the «Taymyr». The ship is now located in the Ob gulf surrounded by thick ice. A second ship is located next by, ship tracking data show. Also that is believed to carry goods for the Arctic LNG 2 project. In the ship cargo are pipes, metal constructions, containers and construction materials. It is now unloaded directly on the ice. The operation is expected to last until 5th April, Atomflot informs. The Arctic LNG 2 is built on the eastern banks of the Gulf of Ob, in the Gydan Peninsula. The natural gas project includes the development of the Utrenneye field and adjacent infrastructure, including a sea terminal, roads, housing facilities and an airport. Production on site is due to start in year 2023. The Arctic LNG 2 will produce a projected 19,8 million tons of LNG per year. It includes three development trains of 6,6 million tons of LNG each. The natural gas will be shipped out through ice-covered waters with a new fleet of ice-class carriers to buyers in Europe and Asia. Project operator Novatek in early March this year signed an agreement with French company Total that gives the latter a ten percent stake in the project, as well as exclusive rights over future developments in the prosperous natural gas region.